Kogi BBQ‘s now-famous Korean taco trucks have eluded me on my last three trips home to SoCal, but this weekend, I was determined to hunt one down. 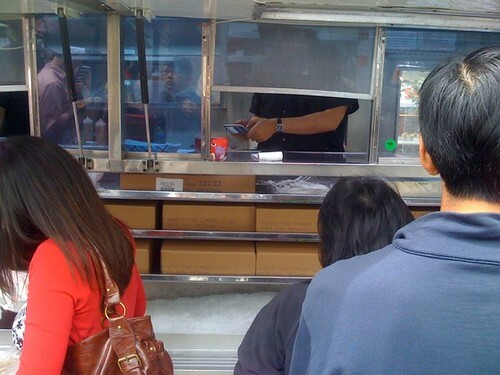 Kogi has two trucks, Roja and Verde, and I met up with Roja yesterday at 9th and Hope in Downtown LA. Let me just say upfront that I think Kogi’s food is great. 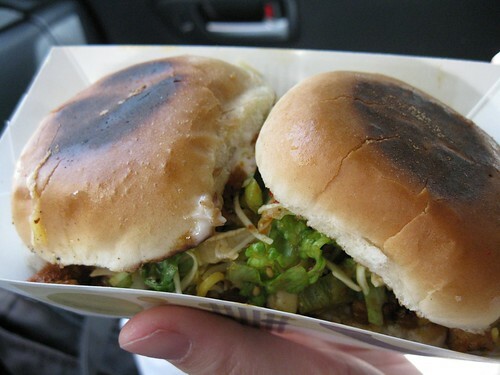 We really liked everything we had, especially the Kogi Sliders and the Kogi Dog. But our first Kogi experience was a logistical disaster. It took two hours from the time we got in line to the time we got our food and left and they ran out of kalbi right before my order was fulfilled, so we missed out on their signature meat. Since Kogi relies on their twitter account (@kogibbq) to keep their devoted followers updated about their whereabouts, it’s appropriate that this review contain my tweets about my first Kogi experience (follow me @inuyaki). 12:17pm mic_dee @inuyaki d00d! aare they quick to serve at least? 12:20pm The @kogibbq line isn’t moving yet because they haven’t started serving. Will see how fast it goes when they start. A few minutes after this tweet they started taking orders. 12:43pm LadyDucayne @inuyaki is the kogi anticipation still going strong? What’s ur place in line? red or green? 12:55pm @LadyDucayne I think we’re about 25 people back. 1:28pm The people that wait 4 @kogibbq at night are either dedicated or crazy. Don’t know if I would do this again unless I was near the front. A couple minutes later we placed our order: 1 kalbi burrito, 2 kalbi tacos, 1 spicy pork taco, 1 chicken taco, 1 tofu taco, 1 order Kogi Sliders, 1 Kogi Dog, 1 brownie with Chinese spiced nuts. I ordered the Kogi Dog because they said they didn’t have enough kimchi to make the Kogi Kimchi Quesadilla. I should have known we were in trouble then. They also announced that they were putting a limit of one burrito or three tacos per customer. There were probably a hundred people behind me at that point. I think the people at the front of the line were buying lunch for their respective offices and depleted Kogi’s supplies right off the bat. My wife said she saw people leaving with bags of food. If this is true, it explains why the line moved so slowly and why they ran out of kalbi. At this point, I stopped tweeting because I was focused on getting my order completed. We were supposed to be at Children’s Hospital Los Angeles at 2:30pm to donate blood platelets for my friend’s daughter, and I was getting annoyed because I didn’t want to be late. Donating platelets is by appointment only because the process takes a couple of hours, but apparently, so does Kogi. They called me to the window to ask what other meat I wanted since they were out of short ribs. I got the spicy pork instead and changed the burrito order to a second brownie. I thought that I might as well get another dessert out of this. I told the guy expediting orders that I needed go to the doctors and that I needed to leave ASAP. The tow truck guys were seen leaving with food five minutes after they arrived. 2:08pm hsiawen @inuyaki that’s BS that means they got your ribs!!! Actually, the guy in front of me, who almost got out of line because it was taking too long, got the last of it. He only had to substitute spicy pork for part of his order. But were the tow truck guys the reason I didn’t get short ribs? We’ll never know. 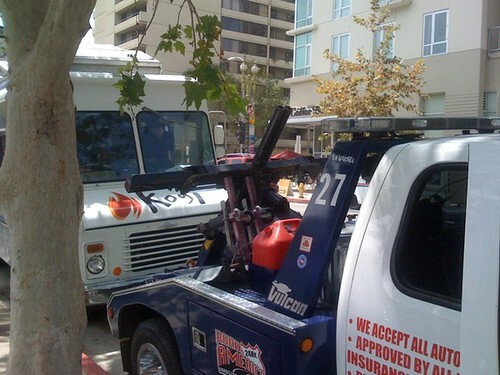 Damn you, tow truck guys! A couple minutes later, we had half our order and were waiting on Kogi Sliders and a Kogi Dog. The guy in the party that ordered after me got his complete order, which included a Kogi Dog and Kogi Sliders, before I did, which was really annoying. I reminded the expediter that I had an appointment. At around 2:15 were in the car and on our way to CHLA, two hours after we arrived. I snapped a couple quick pics of the food before leaving the area, and we ate our food while driving over to CHLA. 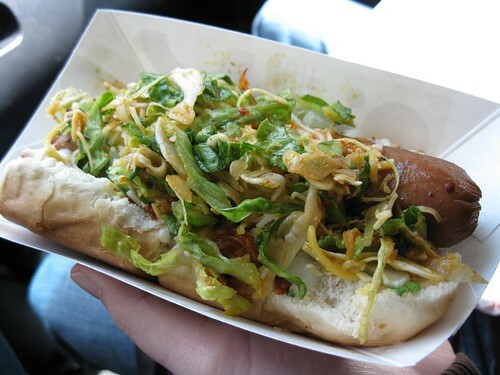 The Kogi Dog was especially challenging to consume…good thing I don’t drive stick. We got to the CHLA blood donation center about 10 minutes late. The last three tweets are from when I was in the chair giving blood. 3:22pm @kogibbq kogi dog was great and i liked the spicy pork. brownie with spiced nuts were nice. just sad you guys ran out of kalbi. If you’re still reading, I commend you for sticking with this epic ordeal. :) Like I said, I think Kogi’s food is great, but I feel like the experience is incomplete because I didn’t get to try the kalbi. I’m also sure they’ll learn from these logistical snafus as they and their fanbase continues to grow. Some people might not give Kogi another shot if they endured a similar experience, but I think what Kogi is doing is worthy of a return visit. It all comes down to planning and understanding, a responsibility that belongs to both Kogi and their customers. Personally, I won’t wait more than 30 minutes for Kogi again, so I’ll have to do my homework and be more diligent the next time I seek them out. I hope Kogi does the same so that they’re prepared to get bumrushed every time their trucks open for business. 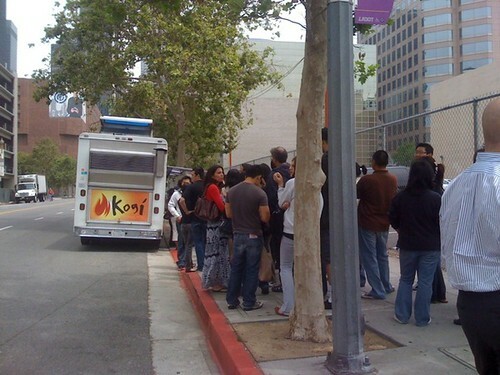 Well, look at it this way, your first Kogi experience was a very memorable one! Oh, I totally feel for you! I finally got my first taste of Kogi by attending an All-You-Can-Eat Kogi charity event! But it was $20 pp. I guess my friend and I were more “patient” or persistent or just plain crazy because we were in line for 2 hours. =) They said they will be in Rosemead at 5 so my friend and I were already in line by 4 anticipating the huge crowd and there was. Due to the traffic either 60 or 10 they were running late and started serving at 6. But it was worth it. We got the kalbi, spicy pork and spicy chicken tacos and those were amazing. The kimchi was just so good. It was tangy and nutty that elmomonster described so well. But like you I think I do my homework as well and be more diligent before seeking them out.